As a college sophomore, I was very taken with Ayn Rand‘s books. At the time, I did not notice the incongruity of espousing her “each person take care of her/himself” philosophy while my parents were paying my way through college. A few years later, after more in depth study and bit more life experience, I could no longer accept her view of the world. Her extreme individualism rejected any government safety net programs and called people who relied upon them “leeches” for not having prepared for their own eventualities. I was surprised to read about Ayn Rand’s old age at Gruntled Center. In the face of the cost of treatments for lung cancer, she signed up for Social Security and Medicare using her legal name, Ann O’Connor. This would not bother me in the least, had she written or said anything to retract her condemnation of those programs. But – in spite of her many tirades against hypocrisy – she quietly accepted government funding while continuing to condemn both the programs and the people who accepted the funding. Ayn Rand has become something of a Tea Party favorite – even though many aspects of her philosophy are at odds with the Tea Party’s platform. They say they admire her “pure capitalism.” Perhaps the discovery that her philosophy faltered in the face of the common problems of the human condition might be a reason to rethink their positions as well. By having your parents pay for your college they were achieving their objective. To get you out of the house and on your own. Heroic individualsim is not thumbing your nose at the world, or ignoring those in need. But it means you do not lay in the gutter waiting for help. The Amish prevalent in my area do not draw any government assistance for anything. They choose to be self reliant and help their community get ahead. They work hard and believe in their work. I would say they are a good example of how society can function by being independent and helpling each other. When adversity arrives like a deranged gunmen killing their children in school, they burn the school down and build at another location and pray for the gunman. I’m also an admirer of the Amish. It’s true that they usually do not draw on government assistance. In a tightly knit small community with a strong shared belief in providing for each other’s needs, they do a great job. However, the Amish can’t serve as a model for the rest of American society (with regard to govt assistance) unless we could somehow organize both the strong shared commitment to sacrificially providing for neighbors, and the same willingness to forego most of the advances of modern medicine and science. 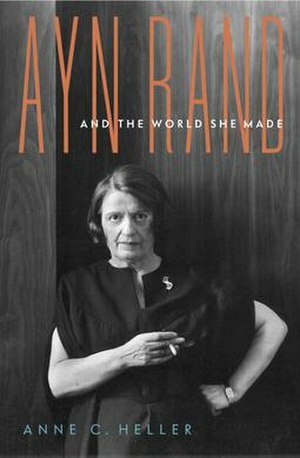 It seems that Ayn Rand didn’t have that strong network of people willing to give sacrificially to cover the costs of her care, and she did want to make use of the best medicine available for her lung cancer. In our loosely connected modern society, we have chosen to express our shared value in sacrificial giving to care for each other as tax-supported health care for vulnerable categories of people. Whether I agree with Ayn Rand or not, she deserves to have adequate health care in her suffering. I think it’s right that our society takes a bit from each of us to make sure that vulnerable sick people are not left in pain and suffering. I do wonder what she did with the money from the sales of her books: she was tremendously popular for quite a while.